Own Spartacus - Complete Collection Blu-Ray from Deff, DVD, Blu-Ray & 4K Video Specialists - Free UK Delivery..
On the heels of the bloody escape from the House of Batiatus that concluded "Spartacus: Blood and Sand", the gladiator rebellion continues and begins to strike fear into the heart of the Roman Republic in "Spartacus: Vengeance". Gaius Claudius Glaber and his Roman troops are sent to Capua to crush the growing band of freed slaves that Spartacus leads before it can inflict further damage. 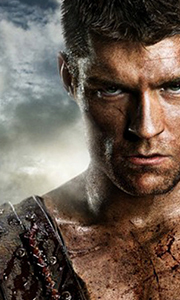 Spartacus is presented the choice of satisfying h..
Gaius Claudius Glaber is dead. Many months have passed since his defeat, and the rebel army, led by Spartacus and his generals Crixus, Gannicus and Agron, continue to amass victories over Rome. With the rebel numbers swelling to thousands of freed slaves, Spartacus is more determined than ever to bring down the entire Roman Republic. Following Ashur's death, Naevia and Crixus fight as one. Together, the rebels engage in one bloody skirm.. Betrayed by the Romans. Forced into slavery. Reborn as a Gladiator. The classic tale of the Republic’s most infamous rebel comes alive in the graphic and visceral new series, Spartacus: Blood and Sand. Torn from his homeland and the woman he loves, Spartacus is condemned to the brutal world of the arena where blood and death are primetime entertainment. But not all battles are fought upon the sands. Treachery, corruption, and the allure.. Betrayed by the Romans, forced into slavery, reborn as a Gladiator. The classic tale of the Republic’s most infamous rebel comes alive in the graphic and visceral new series, Spartacus: Blood and Sand. Torn from his homeland and the woman he loves, Spartacus is condemned to the brutal world of the arena where blood and death are primetime entertainment. But not all battles are fought upon the sands. Treachery, corruption, and the allure.. The House of Batiatus is on the rise, basking in the glow of its infamous champion Gannicus, whose skill with a sword is matched only by his thirst for wine and women. These are the times a young Batiatus has been waiting for. Poised to overthrow his father and take control, he'll freely betray anyone to ensure his gladiators are in the highest demand. And he'll have his loyal and calculating wife Lucretia by his side for every underhan..
Own Spartacus Series 1 to 4 Complete Collection DVD from Deff, DVD, Blu-Ray & 4K Video Specialists - Free UK Delivery..
Own Spartacus - Complete Collection DVD from Deff, DVD, Blu-Ray & 4K Video Specialists - Free UK Delivery..